QUESTION: . . . When we get to the Palestinian stage of things and you're talking about the conference or meeting that you want to hold later this year, how can you, at this point, discuss a two-state solution when one of those proposed two states is in two pieces?. . . .
SECRETARY RICE: . . . [Y]ou can imagine a negotiation for a two-state solution despite what happened in Gaza because you have legitimate Palestinian representation in President Abbas, who is president of all the Palestinians, who is the Chairman of the PLO which is the negotiating authority for the Palestinians, and so he can represent all Palestinians. We would hope that at some point in time when there is a two-state solution that it would be a unifying force for all Palestinians who want statehood, and that's the time at which people will have to make a choice if they're outside of that consensus.
. . . I suspect that this is going to be the first of several trips to make sure that we implement the President's July 16th speech, which means both intensification of the bilateral dialogue between Abu Mazen and Prime Minister Olmert, and the convening of an international meeting later in the year. QUESTION: Just a quick follow-up. Does that mean that you're saying a two-state solution could come before reunification of the two sides of the Palestinians? SECRETARY RICE: A two-state solution can come whenever the conditions are ripe for it, whenever the groundwork has been laid for it, and when Palestinians and Israelis can come to agreement on what that state will look like. I think you have in President Abbas and in the current leadership of the Palestinians people who are dedicated to that. Now, there is a lot of groundwork to be laid. Obviously, the work that Tony Blair is doing in helping to create the Palestinian partner by solidifying or helping to create strong Palestinian institutions is also a very important part of that. A security concept that would work is a very important part of that. But as to the ability to get to a two-state solution, Abu Mazen has that mandate. QUESTION: . . . [D]o you intend to invite or urge the Saudis to send a representative to your international meeting at which an Israeli will also be present? SECRETARY RICE: Robin, I'm not here to issue invitations during this trip. No, seriously, seriously, this is - as I said, this is going to be the first of several opportunities to lay the groundwork for that international meeting. I, frankly, think we need to make - or the Palestinians and Israelis need to really intensify their bilateral track as we move toward an international meeting. 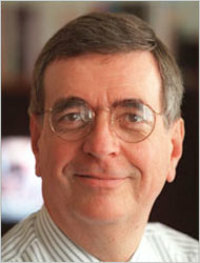 Hoyt called “Al Qaeda in Mesopotamia” an “Iraqi group that didn’t even exist until after the American invasion” and suggested that Times reporters should be asking “tough questions” whenever the President claimed there was a link with Al Qaeda. On July 24, 2007, the President gave a major address at Charleston Air Force Base in South Carolina, discussing in considerable detail the conclusions of the U.S. intelligence community about the links between AIQ and the central leadership of Al Qaeda. How did the Times cover the speech, given the Clark Hoyt admonition about quoting the President, and the Times’ own guidelines that preclude its reporters from even using the name “Al Qaeda in Iraq” and require instead the strange locution of “Al Qaeda in Mesopotamia” (in the words of letter writer J.M Hanes, to “avoid the sin of putting Al Qaeda and Iraq in the same sentence”)? With regard to Amy Klein's article on "The Secret,". . . Klein finishes her article: "In other words, if you were going to boil each of the two visions down to a one-line philosophy, which would you rather choose, Wolpe's 'Life is no picnic' theory or 'The Secret's' 'Life can be absolutely phenomenal?'" Well, the point is that you cannot have the second without the first. Without struggle, one can never deeply know beauty, or love or life. Artistry requires discipline and disappointment. Marriage survives with difficulties and hard-won kindnesses. Friendship and devotion is never frictionless and free. Life can be "absolutely phenomenal," but not by simply wishing it so. Contrary to the simplicities of "the Secret" the world is not only about me, and the variegated colors of life are the gift of effort that elevates our souls and reaches out toward others. [Regarding Peter Berkowitz's "The New New Atheism"] . . . “Scientific atheists” make a startling inference from infinitesimal evidence. That evidence consists of the physical Earth and its history – as perceived by scientists through instruments of their own design and creation – which amounts to the consideration of a fraction of our solar system which is a fraction of our galaxy, which is a fraction of the universe. The startling inference from this non-random and insufficient sample? There is no God! Instead, they posit spontaneous generation and the existence of intelligible but not intelligent laws. At this point one can only recommend a refresher course in Statistics 1. With regard to the July 25 letter writer’s concern about the “premature” publicizing of exit strategies from wars, the announced strategy for World War II certainly did not give aid and comfort to the enemy. It was called unconditional surrender. In his July 16 address, President Bush announced an international meeting this fall among Israelis, Palestinians and other countries, to be chaired by Condoleezza Rice, to “provide diplomatic support” for “negotiations” to “move forward on a successful path to a Palestinians state” -- notwithstanding the utter failure of the Palestinians to begin dismantling their terrorist infrastructure, as required by Phase I of the Roadmap. It sure sounded a lot like Recommendation 14 in the Report of the Iraq Study Group, which urged the “unconditional calling and holding of meetings, under the auspices of the United States or the Quartet . . . between Israel and Palestinians . . . to negotiate peace as was done at the Madrid Conference of 1991 . . .” (which the Iraq Study Group apparently believed was relevant to Iraq). Last week, the Quartet endorsed Bush’s call for an international meeting, using the precise words from his address. MR. SNOW: We don't know yet. And it's really -- I would -- even though I know I used the term "conference" this morning, this is a meeting. It is a meeting that is designed -- it is -- I think a lot of people are inclined to try to treat this as a big peace conference. It's not. This is a meeting to sit down and try to find ways of building fundamental and critical institutions for the Palestinians that are going to enable them to have self-government and democracy. Q And who is in charge? Former Prime Minister Blair or (inaudible)? MR. SNOW: No, Prime Minister Blair, obviously, as the Quartet representative. It's not anybody in charge. What it is, is a gathering of people who are interested. You're going to have parties in the region; you're also going to have Prime Minister Blair as the Quartet representative. They are going to be sharing ideas, trying to figure out how to move forward. So: it’s not a conference, it’s a meeting -- actually, it’s a gathering, an opportunity to share ideas. Nobody’s in charge. They’ll talk about building Palestinian institutions. MR. MCCORMACK: . . . She's going to obviously touch on the meeting that the President announced will be held in the fall time about moving forward the political track between the Israelis and the Palestinians and we hope between the Israelis and the Arab states. . . . She’s going to talk to Prime Minister Olmert and President Abbas about how they can move forward their political track, where they stand in their discussions and how we can help them move forward. She's going to be talking with both Egypt and Saudi leaders . . . . I expect they will also touch on Israeli-Palestinian issues, Israeli-Arab issues, and I'm sure that they will probably also touch upon this meeting that is planned for the fall time. . . . QUESTION: There is no special objective, precise objective she wants to achieve? MR. MCCORMACK: Well, all of this -- you know, all of this, all of these engagements, all of these trips, all of these meetings, all of these discussions with these leaders are to talk about concrete ways in which they can act to move the process forward. Ultimately, this will come down to Palestinians, Israelis and Arab leaders making tough decisions about how to bring about a more peaceful Middle East. We're going to be right there with them. We're going to be pushing. We're going to be prodding, cajoling, encouraging and doing what we can to move that process forward and all of these meetings are part of that process. QUESTION: But she's not going there to talk about, sort of, final status issues or anything like that? MR. MCCORMACK: Hey, she's going to go there to talk about how to move forward the political track. . . . QUESTION: So is she also going to be looking at specifics for the conference at the -- in the fall of the meeting or where it's going to be? MR. MCCORMACK: That's where all of this is, in part, leading. . . . The meeting is a mechanism through which we can all try to move forward a political track. Who do you think will be pushed, prodded, and cajoled into making “tough decisions” – even before the Palestinians have commenced compliance with Phase I of the Roadmap? I remember not so long ago when the U.S. promised there would be two phases before this, and when Israel acted in reliance upon that promise. How all this will add to the U.S. reputation for reliability in either Iraq or Israel (or impress adversaries who already doubt the strength of U.S. commitments) is beyond me. In an unprecedented move, the ministry has approved a geography text for third-grade children that says some Arab citizens were expelled from their homes and became refugees because their villages were destroyed during and after the war. The textbook -- "Lihyot Yahad Beyisrael" ("Living Together in Israel"), an Arabic translation of a Hebrew text published about a year ago, is slated to be integrated into the curriculum in the coming school year. 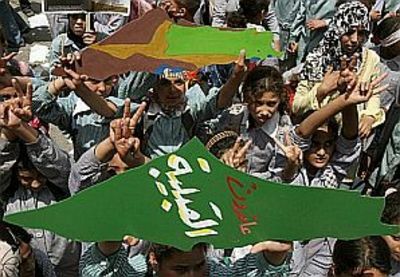 At the end of 2006, the Palestinian Authority (PA) Ministry of Higher Education introduced new 12th grade schoolbooks, written by the Center for Developing the Palestinian Curricula. The center is comprised of Palestinian educators appointed by the Fatah governments of Yasser Arafat and Mahmoud Abbas . . . . responding to widespread international criticism of the old textbooks . . . . The following terms all replace Israel, its founders, and status: “The Zionist enemy;" “The Zionist entity;” “The enemy of this people;” “The Zionist gangs;” “Zionist Imperialist plan.” Israel’s creation is “the occupation;” “stole Palestine;” “stole its land;” “in 1948, when the Jews occupied Palestine.” . . . . With these as the educational messages, the next generation of Palestinian youth is actively being prevented from having any reasonable possibility of accepting Israel as a neighbor in reconciliation and peace. Palestinian children commemorating the "Nabka" earlier this year, with maps not showing Israel. (AP Photo). 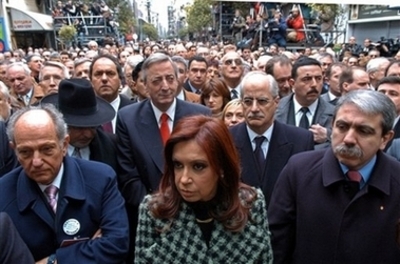 President Nestor Kirchner and his wife, Sen. Cristina Fernandez de Kirchner, joined other government officials and Jewish leaders from Argentina, Israel, Chile and Uruguay for a ceremony at the site of the attack, which killed 85 and wounded more than 300. A shofar was sounded followed by a moment of silence to mark the moment of the attack at 9:53 a.m.
At the ceremony, AMIA President Luis Grynwald urged Kirchner to sever diplomatic ties with Iran, which sponsored the bombing, according to experts familiar with the case. Though arrest warrants have been issued for some former Iranian officials, none have been brought to justice. Some secondary participants have been sent to prison, but the perpetrators of the bombing remain at large. (JTA Report). 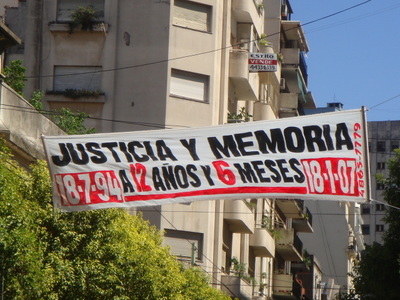 A banner on the street across from the re-built Jewish Community Center in Buenos Aires, Argentina, noting 12 years, six months since the July 18, 1994 bombing. (JCI Photo taken in January 2007). BUENOS AIRES, Argentina — Sirens will sound across Argentina this morning as the nation marks the anniversary of the biggest attack on a Jewish community outside Israel since World War II. 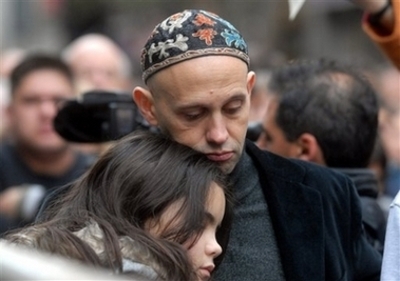 The car-bombing of the Jewish Community Center in Buenos Aires 13 years ago killed 85 people and injured 300. No one has been convicted of the crime. At 9:53 a.m., the time of the explosion, sirens of all federal police cars, motorcycles, and precincts will be set off, along with those of fire trucks and fire stations. Sounding the sirens is part of a call for the perpetrators to be brought to justice, said Aldo Donzis, president of the Delegation of Jewish Associations, which is coordinating commemorative services this week. Over the years, the case has been marked by incompetence and accusations of cover-ups. 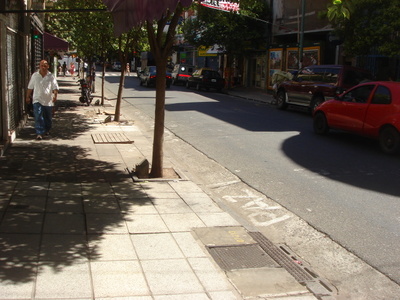 All suspects in the "local connection" (among whom many members of the Buenos Aires Provincial Police) were found to be not guilty in September 2004. 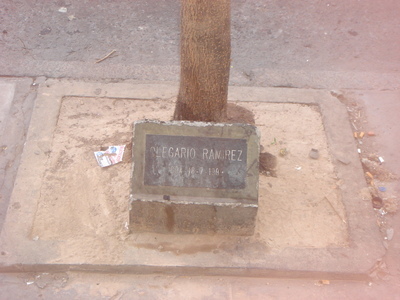 In August 2005, federal judge Juan José Galeano, in charge of the case, was impeached and removed from his post on charge of "serious" irregularities and of mishandling of the investigation. 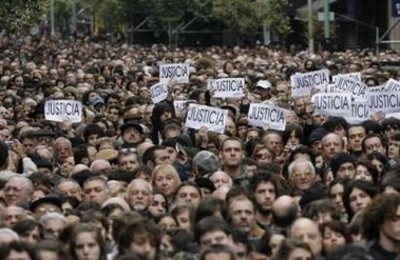 On October 25, 2006, Argentine prosecutors Alberto Nisman and Marcelo Martínez Burgos formally accused the government of Iran of directing the bombing, and the Hezbollah militia of carrying it out. 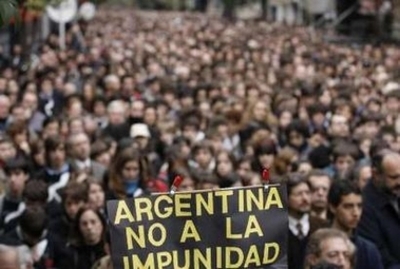 According to the prosecution's claims in 2006, Argentina had been targeted by Iran after Buenos Aires' decision to suspend a nuclear technology transfer contract to Tehran. 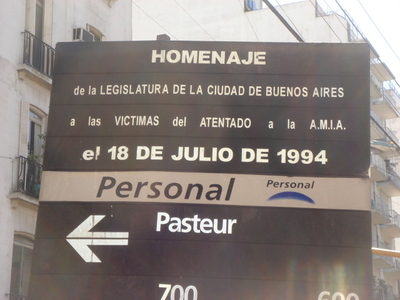 A large sign at the end of the street marks the date of the bombing and commemorates the victims . Trees are placed behind mall memorials to each person murdered. 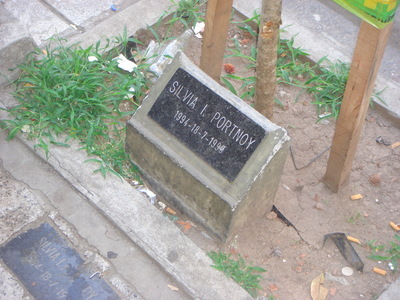 The event is very much a current event in Buenos Aires, more than a decade after it occurred. The investigation is continuing, and independent journalists are also investigating. (JCI Photos). On April 11, 2005, Ariel Sharon met with George W. Bush in Crawford, Texas to discuss the disengagement plan under which Israel -- required under Phase I of the Roadmap only to dismantle unauthorized settlement “outposts” erected since March 2001 and “freeze” settlement activity -- would completely dismantle all 21 longstanding settlements in Gaza and withdraw all Israeli forces, giving the Palestinians a chance to rule themselves, demonstrate their readiness for peace, and finally commence their Phase I obligations under the plan they had accepted two years before. Bush and Sharon had negotiated a disengagement deal the year before, in an exchange of letters agreeing that, after the disengagement, there would be: (1) no political discussions with the Palestinians before they dismantled terrorist organizations and infrastructure; (2) no eventual return to the indefensible Auschwitz borders of 1967, and (3) American-led efforts to insure that post-disengagement Gaza would not threaten Israel. Q Mr. President, do you support the Prime Minister [Ariel Sharon] position as he stated now that after the disengagement, there will be no -- any other political steps until a final and complete dismantling of terror organization, and only then we can proceed on the political track? . . .
PRESIDENT BUSH: . . . The Prime Minister is taking a bold step and a courageous step, and basically he's saying that, you know, until he sees more progress, he doesn't have confidence [in the Palestinians]. . . . And I'm convinced the place to earn -- to gain that confidence is to succeed in the Gaza.
. . . I believe that it is possible to work to set up a self-governing entity in the Gaza. And I believe a self-governing entity is one that is going to be peaceful, because most people want there to be peace. And when that happens, then all of a sudden, I think we'll have a different frame of mind.
. . . I just suspect that if there is success in the Gaza, in other words, if there's a state that's emerging, the Prime Minister will have a different attitude about whether or not it makes sense to continue the process. . . . And so I want to focus the world's attention on getting it right in the Gaza . . . . In the face of all this, George W. Bush now decides the next step is to sponsor an international conference, to be chaired by Condoleezza Rice (and endorsed by the Quartet later this week), to address final status issues -- without prior fulfillment even of Phase I of the plan he promised Sharon the U. S. would enforce. What Bush has done is to swallow whole Recommendation 14 in the Report of the Iraq Study Group, which urged the “unconditional calling and holding of meetings, under the auspices of the United States or the Quartet . . . between Israel and Palestinians . . . to negotiate peace as was done at the Madrid Conference in 1991 . . .” -- as part of a grand bargain to achieve peace in our time. We all remember how well that prior process worked out -- Dennis Ross wrote a whole book about it. More importantly, George W. Bush promised three years ago that there would be no unconditional initiation of that process again. His speech yesterday is the Harriet Miers of peace plans, only worse. 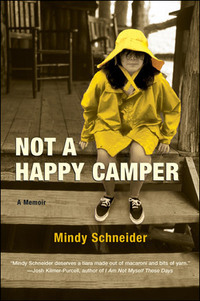 Schneider has written a 240-page “memoir” of her experiences as a 13-year old camper at Camp Kin-A-Hurra in Maine back in 1974. It is an engaging and endearing book, covering some nearly universal summer camp experiences: facilities that were not quite what had been promised in the brochure, barely edible food, rich-kid bunkmates with names like Autumn Evening Schwartz, continual boy-girl anxieties, the trauma of the first kiss, the mid-summer visit of the parents, harrowing field trips, the end-of-summer awards ceremony (her award as “Best and Worst Athlete” -- for her simultaneous success and failure at different sports -- was later listed on her 13 college applications, at her father’s suggestion, minus the words “and Worst”), the last dance, the where-are-they-now outcomes from the 1997 reunion. 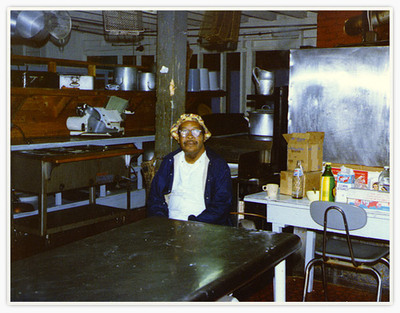 We watched as he assembled the ingredients on the long wooden table: vast amounts of eggs, sugar, flour, water, yeast, margarine, and honey. I’d never thought about what went into a challah, just that it came out of a plastic bag. . . .
“[B]efore we start, who knows why we make the challah? For all the years of Hebrew school among us, no one knew the answer. “Maybe you do?” I proposed. “Walter, why don’t you tell us?” Maddy suggested. “All-righty then. Eleven of the twelve tribes were farmers, raising their own food. But the twelfth tribe, the Levis, took care of the temple. Thank you to Power Line, HughHewitt.com, South Carolina Conservative, Random Jottings, Memeorandum, Ed Driscoll, Flash Report, and Road to the Middle Class for linking to yesterday’s post on Natan Sharansky and Hugh Hewitt at the Republican Jewish Coalition dinner at the Reagan Library. Why only 6 min, 40 seconds? Note to JCI Technical Staff: next time, re-charge the battery before the event. But even this short excerpt is worth viewing in its entirety.